Transparent Office Tape- Commonly referred to as "Scotch tape" is one of the most commonly used tapes in the world. Used for a variety of applications including: sealing envelopes, repairing torn paper products, holding light objects together, etc. Gaffers Tape- A heavy fabric or plastic tape. Commonly used in the entertainment industry to hold down cables and chords. The adhesive leaves little residue and removes cleanly from objects. Duct Tape- Has a plastic coated fabric backing and a strong adhesive. 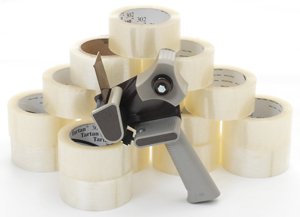 Often used by people who need a strong and versatile tape that can be easily torn by hand. Masking Tape- Used for painting and protecting surfaces that should not be painted. Usually consists of a paper backing and an easy to remove adhesive. Electrical Tape- Commonly made of vinyl it is designed to stretch and conform to irregular shaped surfaces. Used to help wrap electrical wires to protect them from the elements. Double-Sided Tape- Has an adhesive on both sides, used for attaching two surfaces. Filament Tape- Has fiberglass filaments embedded to increase strength and integrity of the tape. Spike Tape- A thinner version of Gaffers tape used to mark a place where people need to stand or where equipment needs to go. Richard Drew was an engineer for 3M in the mid 1920's. He began to develop a tape in 1925, a two inch wide tan tape with a pressure sensitive backing. The intention was to provide auto painters with a tape to help them cover items that are not to be painted. When Drew was testing the tape to see how much more adhesive was needed a painter became frustrated and told Drew to "Take this tape back to those Scotch bosses of yours and tell them to put more adhesive on it!" The Scotch name was applied to the entire line of 3M tapes after that. The first tape that Drew invented was composed of oil, resins, and rubber. When the adhesive is applied to its backing it must be in a liquid state to spread. These days, chemist use a chemical or physical process to transform the adhesive into a bonding agent. The method used depends on the desired strength of the bonding agent. The next important Scotch invention was in 1932 when the first hand held tape dispenser was invented. It was composed of cast iron and weighed almost 7 lbs. After that in 1937 the "snail", Scotch's iconic tape dispenser was invented. Since the invention of the hand held Scotch tape dispenser, Scotch tape has become an iconic part of the American culture. Often times it is used as a general term for people desiring a clear adhesive tape. 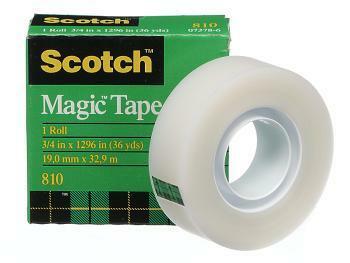 U.S. Packaging & Wrapping is proud to offer Scotch Brand tape along with Tartan Brand tape, both 3M adhesive tapes. It is important for companies using packing tape to choose the proper tape and strength when deciding a tape to seal their cartons and boxes. The wrong choice of tape can cost companies money, time, and disrupt efficiency. Common terms used to help describe tape are listed below. Tensile Strength- Measures the force required to pull something to the point where it breaks. Click here for a blog post about tensile strength. Backing Material- Material of a tape the adhesive is applied to. Common tape backing materials are vinyl, cloth, and polypropylene. Elongation- How far a tape can stretch before it breaks. Elongation is commonly measured in a percentage of stretch and tensile strength is measure in pounds. Core Size- The inside roll diameter of a tape. Length- The length of the tape on the roll. Commonly measured in meters, yards, or feet. Width- The width of the tape on the roll. Commonly measured in millimeters or inches. Thickness- How thick a tape is. Commonly measured in mils (milli-inch) which is one-thousandths of an inch or 25.4 microns. What to Consider when choosing a packing tape? Heavier loads tend to put more stress on packages. For heavier loads a strong wider packing tape is recommended. Contents that shift within a package tend cause more stress on the center seal and a stronger wider tape should be considered. When the content of a package are considered valuable, and stronger wider tape should be used to ensure a safe seal and delivery. Expensive Scotch 375 Packing Tape 2" or 3"
Wider stronger tapes are ideal for long packages with heavy contents. If the package does not contain heavy contents a 2 inch tape may be used. Commonly a 2 inch tape is ideal for packages up to 24 inches wide. If the contents of the package are not excessively heavy or contain sharp edges. If the package or box exceeds 24 inches a stronger wider tape should be considered. Heavy board boxes have a higher strength in the box flaps and put more pressure on the tape seal. Tapes with high shear strength adhesives are recommended for these types of boxes. Rough and corrugated boxes tend to have a washboard surface that may require special high tack adhesives. Box strength is commonly measured in two forms of measurements. Below are the two common forms to test box strength. Edge Crush Test- Standardized measurement of the compression strength of a column of corrugated board. Results are measured in ECT. A piece of cardboard with a 32 ect means that stood on edge the board can withstand 32 lbs.. per square inch before crushing. Burst Test (Mullen Test)- The force of pounds per square inch required to burst the side of a cardboard box. A box with a burst strength of 200 lbs. can withstand up to 200 lbs. per square inch internally or externally before bursting. Cartons shipped individually tend to have more pressure placed upon them due to individual handling. Cartons shipped on pallets are generally shipped as a unitized load which exerts less pressure on each individual carton. High or low temperatures when shipping should also be considered when choosing a packing tape. Temperatures, sunlight, and moisture all impact the seal of packing tapes.